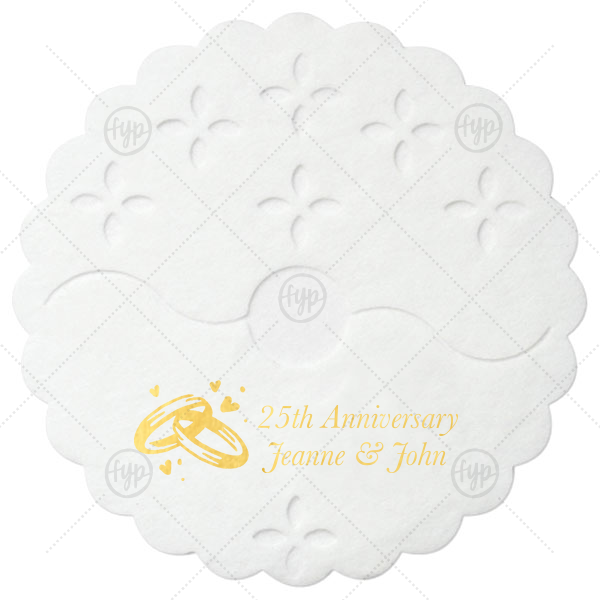 Our Coasters are all made of a pulp board material that is suitable for several reuses. Each style is 4" at its widest point. Color variations are available according to shape: Round: White on both sides (40 pt pulp board), Eggshell on both sides (60 pt pulp board), Black Leather (coated leather) Square: White on both sides (40 pt pulp board), Eggshell on both sides (60 pt pulp board), Black Leather (coated leather) Hexagon: Gray/Black (40 pt pulp board) Deco: Gray/Black (40 pt pulp board) Nouveau: Kraft/Blush (40 pt pulp board) Ornament: Kraft/Blush (40 pt pulp board) Full Color/Photo Coasters: White Square Coasters Personalize your Coasters with text and illustrations from our extensive, designer-curated collection. With a variety of shape options, over 150 fonts, 50 foil colors and 1,300 clipart images, you can create the perfect party accessories for your event. You also have the option to Upload Your Own Art for a truly unique product. The ever-popular White Stem Wrap with Shiny 18 Kt Gold Foil Color has a Wedding Rings graphic and is good for use in Wedding, Anniversary themed parties and will look fabulous with your unique touch. Your guests will agree!